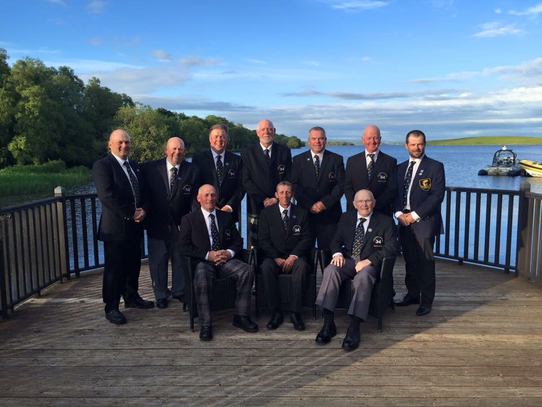 Scotland's Disabled Team have returned from Lough Melvin with Gold Medal for a record 6th year in a row. Over 2 days of competition Scotland proved once again that team work and great support was the recipe for success. The final results were a convincing victory over the other home nations. Team and support were Willie Brash, capt, Bill Barnes, Jim Crawford, David Malcolm, Colin Broadhead, George Bell, Graham Steel and Andy Smith. Team manager Wullie Leach and official support Neill Barrett. SDFFA would like to thank sponsors Lightways, ND Barret Electrical, BVG Airflo and Lake of Mentieth Fisheries. Thanks to all the anglers who attended our fundraising events throughout the year and to the fisheries that supported our team. Next year Scotland are hosts at Lake of Menteith in June. 35th International held at Eyebrook 24th and 25th June 2014. Scotland Disabled anglers achieved a record 5th straight gold medal at the recent Home International at Eyebrook. In warm conditions, whilst fish were showing on the surface, tactics were fast sinking lines and buzzers fished in the dam area between the Tower and Harrisons Corner. Slow retrieve back to the boat put the buzzers at correct depth. Team Scotland recovered from a small deficit of 8ozs after day 1 to excel in their tactics. A superb first hour on day 2 saw all Scotland Team catching securing a lead that turned the match in their favour. 6 of the 7 man team caught full limits of 8 fish on the second day to secure a comfortable victory. Team Scotland were Bill Barnes, captain, Willie Brash, Fraser Renwick, George Bell, Tony Lithgow, Jim Curry, Graham Steel, Reserve Colin Broadhead. Team Manager Wullie Leach and support from Neill Barrett. 30 anglers competed for the National Championships for anglers with a disability on Sunday 10th May. Competitors fished 2 fish limit then catch and release. 135 fish were caught, 81 of which were returned.Conditions varied from calm to windy and heavy rain. Most boats headed for east basin, the Butts, Lochend and International Bay. Fishing buzzers remains prominent. National Champion was Jim Crawford, Ayr with 12 fish. The top 7 anglers and 1 named reserved will be invited to represent Scotland at the Home International in June 2016 at Menteith. In finishing order, those qualified were Jim Crawford, John Hood, Dave Stewart, Ossie Smith, Glen McHattie, George Bell, David Malcolm and reserve Stuart Fraser. SDFFA would like to thank Lake of Menteith Fisheries for their generous sponsorship of the boats, to all the boatmen who helped out on the day, Douglas and Quint for getting us out and Wullie Leach as Competition Official. 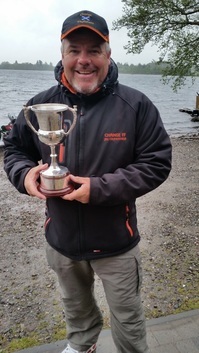 Willie Brash from Dalkeith is the new Scottish Disabled Angling Association Champion. Willie had a great weekend also qualifying for Champion of Champions from his heat in Scottish Clubs heat on Saturday night. Willie had 18 fish, fishing buzzers. 34 anglers competed on Sunday for the National Championship. 149 fish were caught with 85 returned. The Top 7 anglers were selected to compete for the Scottish Disabled Team to compete in Ireland in 2015. The team are in order Willie Brash, Jim Crawford, Bill Barnes, George Bell, Wullie Fulton, Graham Steele and David Malcolm. 1st reserve is Colin Broadhead and will travel with team. SDFFA would like to thank Lake of Menteith who generously sponsored the boats, to Quint and Douglas in particular for helping us out on the day. In addition SDFFA wish to thank all the boatmen who gave up their Sunday to help our anglers. 37 anglers took part in the National Final at Lake of Menteith on Sunday 12th May. SDFFA would like to thank all the boatmen who gave up their time to support the anglers, to Quint and Douglas, to Wullie Leach for results and to Carole and her team at the lodge for the excellent catering for everyone. New Champion is Jim Curry from Irvine. The top seven rods plus 1 reserve will represent SDFFA Team Scotland at Eyebrook in England in 2014. The full team in order are Jim Curry, Wullie Brash, Fraser Renwick, Tom Ward, Wullie Fulton, Bill Barnes and Tony Lithgow. Graham Steele is travelling reserve. Here are photos from event and prizegiving. returned. The Scotland Team were Jim Crawford(Capt), Bill Barnes, Willie Brash, George Bell, Tony Lithgow, Ossie Smith, Rab Chisholm, David Penny and Manager Willie Leach. The full results are here. The 2 fundraisers will be at Parkview Fishery, Fife on Sunday 1st April and at Arran View Fishery on Sunday 29th April. Full details for both events are here. If you are able to make a donation or give a prize please contact local organisers or the SDFFA Secretary here. Scottish Disabled Fly Fishing Association(SDFFA). The SDFFA are responsible for running the Scottish National Fly Fishing Championships for anglers with a disability. The Championships is open to members who register with the SDFFA and from this event the top seven rods are invited to represent Scotland in the annual International Fly Fishing Championship for Anglers with a disability. Only anglers registered with SDFFA will be invited to compete at the national championship. To register applicants can request a form by e-mail from the SDFFA Secretary here.